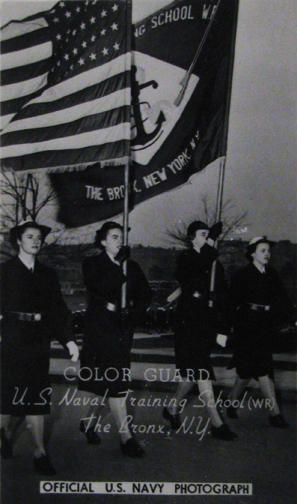 In early February, 1943, the Navy opened its new WAVES boot camp at Hunter College. The Bronx, New York campus (now known as Lehman College) was commandeered by the Navy for the duration of the war. Boot classes of two thousand women would begin every two weeks or so. They would spend six weeks at Hunter learning military basics before being moved along to specialty training. This photograph comes from a postcard booklet designed for WAVES recruits to send it home to their parents, families and friends. It shows the flag of for the Hunter College training station. It is from the Betty H. Carter Women Veterans Historical Project at the University of North Carolina Greensboro.